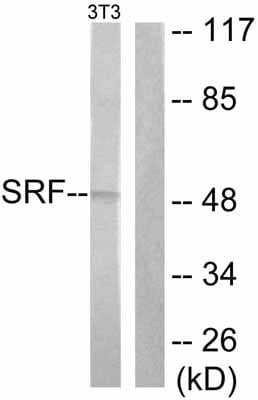 ab53147 detects endogenous levels of total Serum Response Factor SRF protein. Synthetic non phosphopeptide derived from human Serum Response Factor SRF around the phosphorylation site of serine 99 (S-L-S-E-M). ab53147 was affinity purified from rabbit antiserum by affinity chromatography using epitope specific immunogen. Our Abpromise guarantee covers the use of ab53147 in the following tested applications. WB 1/300 - 1/1000. Detects a band of approximately 62 kDa (predicted molecular weight: 52 kDa). 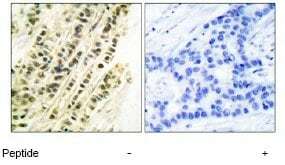 Immunohistochemical analysis of Serum Response Factor SRF in paraffin embedded human breast carcinoma tissue using ab53147 at a dilution of 1/50. Right hand image: treated with immunising peptide. Left hand image: untreated. Publishing research using ab53147? Please let us know so that we can cite the reference in this datasheet. There are currently no Customer reviews or Questions for ab53147.